1: Gay Meadow was opened in 1910 and was a former site for carnivals and fairs in the town centre. Shrewsbury Town formerly played at the Copthorne Barracks in the local Army camp but were evicted, thus the need for the new ground. 2: The first league match to be played at Gay Meadow was a 2-1 win for Wolverhampton Wanderers Reserves on Saturday 10th September 1910 with Billy Scarratt scoring the Shrews first ever goal at the ground. On the 24th September, they got their first win with a 2-0 win over Halesowen Town. 3: Floodlights were installed in the late 50's with the first official match under them being a game against QPR with a 3.15PM kick off. The following week, on the Friday 25th November 1960 a game to mark their installation occurred with a 5-0 demolition of Stoke City being watched by 5,448. 4: For the first part of their history, The Shrews played in non-league football, competing in the Shropshire & District League (runners-up in 1891), The Birmingham & District League (winning it in 1923) and the Midland Champions League (champions on 3 occasions) before their election to the Football League. They would return to non-league football for one season in 2003/04 following their relegation from the league, finishing 3rd and beating Aldershot Town in the playoff final to earn an immediate return. 5: After a good spell in the Midland Champions League they were elected to the Football League in 1950 after it was expanded from 88 to 92 clubs. Starting in Division 3 North, which became Division 4 on reorganisation, their golden period came in the late 70's when a rapid rise up the leagues saw them promoted to the second tier. They would go on to record their best ever finish - 8th in Division 2 on two occasions. Their darkest days came in 2003 when after finishing rock bottom of Division 3, they were relegated to the Conference. 6: They have reached the FA Cup Quarter Final twice - losing to Wolves in 1979 and Leicester City in 1982. On the flip side between 2007 and 2011 they faced 4 consecutive 1st Round exits including defeats to non-league sides Blyth Spartans and Staines Town. 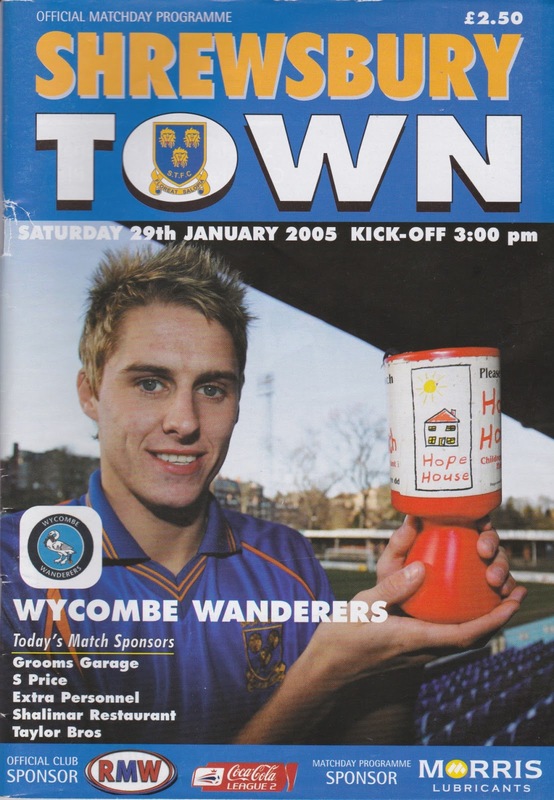 7: The Shrews reached the inaugural League Cup semi-final, losing 4-3 on aggregate to Rotherham United. The highlight of the run was a 2-1 win over Everton in the Quarter-Final. 8: The club would reach Wembley for the first time in 1996, losing the Football League Trophy Final 2-1 to Rotherham United. 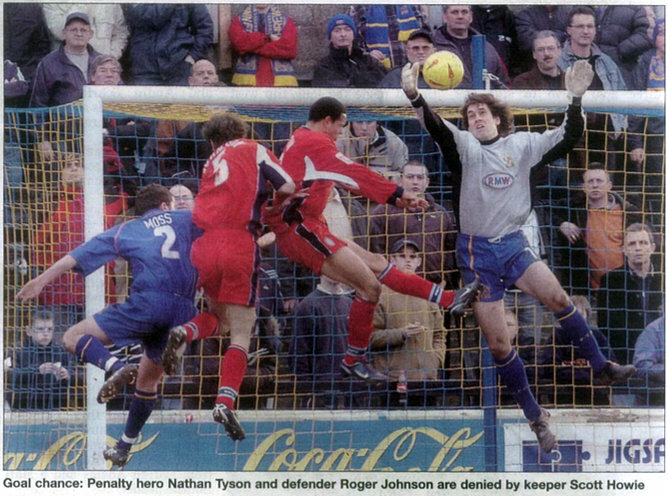 Nigel Jemson got both the goals - ironically he would later join the Shrews, scoring both goals in a 2003 giant-killing of Everton in a 2003 3rd Round FA Cup tie. 9: Current England keeper Joe Hart remains the most famous name to turn out for Shrewsbury Town. He made 58 appearances for the club before moving to Manchester City in 2006 for a six-figure sum. 10: Shrewsbury Town's last ever competitive game at the ground came on 14th May 2007 as they drew 0-0 with Milton Keynes in the 1st Leg of the League 2 playoffs. Happily they won 2-1 in the second leg to reach Wembley but lost to Bristol Rovers 3-1 in the final. I can't remember my visits to Gay Meadow with any great detail, though I do remember an incident before the first game. I went on the coach with workmates and friends Paul & Sue and Paul had been working before the game. Some old biddy had walked out in front of his forklift without looking and she had headphones on so she didn't hear the truck coming. Result - a broken ankle and a shaken up Paul. Thankfully the result up in Shropshire was a lot more positive with Wycombe having much the better of the game and winning it with a Nathan Tyson penalty which he won himself and converted just before the half hour. It was a scrappy game of few chances but it was good to get 3 points, especially as we had gone 6 games without a win. Subsequent visits yielded 2 more draws. The second game was probably the best in terms of entertainment. It was again Nathan Tyson that came up with the goods, giving Wycombe the lead on 34 minutes with a neat goal past future England keeper Joe Hart. Despite Wycombe carrying on attacking and having several more chances they were undone 5 minutes from time when Colin McMenamin headed in a Ben Herd cross. The third game was another draw, this time a goalless one that will not live long in the memory. GAY MEADOW was a quaint little ground, situated really close to the town centre in Shrewsbury, so it made for a good day out with plenty of places to eat and drink. One of the most notable things about the ground was that there was a river behind the covered terrace and the club used to employ someone in a boat to fish wayward clearances out of the river. It was certainly a ground with plenty of character, something I did not really appreciate enough at the time. Away supporters got a partly covered terrace known as THE STATION END. This held up to 2000 fans and was unusual in that it had fencing at the front right up until it's closing, unlike most others who removed theirs after the Hillsborough Disaster and Taylor Report. The terracing was quite shallow but it never proved an issue to me as Wycombe never took a huge following there. To the right of the away terrace was the RIVERSIDE TERRACE with a capacity of just over 2000. It got its name from its location right by the River Severn with many clearances ending up in the drink behind it. Completing the terraces was the WAKEMAN END which took its name from the school behind it. It was uncovered and had a capacity of around 1400. The only seated area was the EAST STAND which held just over 3600 fans, including 250 seats for away supporters.